TRUEMRK COMBINES BRAND PROTECTION AND CONSUMER ENGAGEMENT INTO A SINGLE, INTUITIVE EXPERIENCE. TrueMrk® helps brands deliver assurance about product authenticity and provenance to consumers while using the power of deep data analytics and advanced algorithms to help combat fraud. TrueMrk increases consumer trust and embraces consumer needs for product information while protecting and enhancing your brand. For brands, implementing a brand protection and marketing program with TrueMrk is simple. Two billion consumers with a smartphone want tools to find your authentic products. TrueMrk is an easy to integrate solution that arms consumers in the battle against product fraud while satisfying their demand for information. TrueMrk enables frictionless product serialization with plug & play simplicity, giving every product a unique identity in the connected world. TrueMrk is easy to implement, easy to use – and requires no infrastructure or software to maintain. TrueMrk leverages built-in smartphone features. No special scanning equipment, application, ink or paper is required. This greatly reduces the time and cost to a brand deploying. Once applied, TrueMrk allows consumers and supply chain inspectors to verify the authenticity of a product with a simple scan using their smartphone. By harvesting data during the scan process and applying proprietary algorithms, TrueMrk identifies incidents of unusual or fraudulent activity. For consumers, verifying the safety of a product with TrueMrk is simple. Once applied to a product or package, consumers can verify the authenticity of a product and view product information with a scan of their smartphone. Empowering consumers to authenticate products captures a richer and broader array of data than other methods of brand protection. TrueMrk turns ordinary packaging into safer, smarter packaging. Leverage high-value connections for Marketing & CRM. Consumers who use TrueMrk to identify authentic products are more motivated, more loyal, and more visible than a typical consumer. Authentication opens a channel for brands to converse with consumers at whatever moment suits their strategies — to manage product after-care, recalls, reward repeat business, introduce additional products, deliver targeted promotions — the choice is yours. TRUEMRK CAN BE INTEGRATED INTO A PRODUCT LABEL OR PACKAGING, OR APPLIED AS A SEPARATE LABEL. TrueMrk™ adds unit level serialization and tracking to product labels and packaging. At the heart of each TrueMrk label is an intelligent, secure QR Code which contains a public URL, unique fingerprints matched to a manufacturer's database and other product information/supply chain data. TrueMrk can also be combined with other anti-counterfeiting printing methods. CLEAR AND SIMPLE REPORTS ARE DESIGNED FOR PEOPLE, NOT SPECIALISTS, ALLOWING ANYONE TO TURN INSIGHTS INTO ACTION. Each scanning event generates data that can be immediately visualized at Delivr’s online portal. Activity on a per unit or aggregate basis can used to identify incidents of counterfeiting and grey market diversion. Brands can access this business intelligence in real-time. to recognize patterns and take actions to protect their brand. Delivr is a marketing technology platform used by thousands of businesses to drive audiences from print to digital experiences. Established in 2008, Delivr has developed software to track and visualize consumer engagement with printed media, labels and packaging. Delivr is now extending its marketing, consumer engagement and analytics platform to authenticate products and identify incidents of counterfeiting and gray market diversion. Delivr is a licensed DENSO Partner. Fill out the form below or call us at +1-631-750-2785. 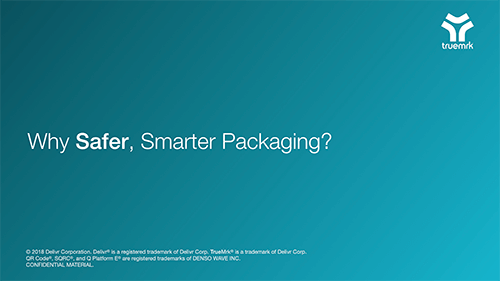 REQUEST your copy of "Why Safer, Smarter Packaging?"